Yards Brewing Company and the Philadelphia Brewing Company keep up with the tradition of brewing good, local beer in Philadelphia. When the Founding Fathers wrote in the Declaration of Independence that every man had the right to “the pursuit of happiness,” it is quite possible that they considered beer a part of that. 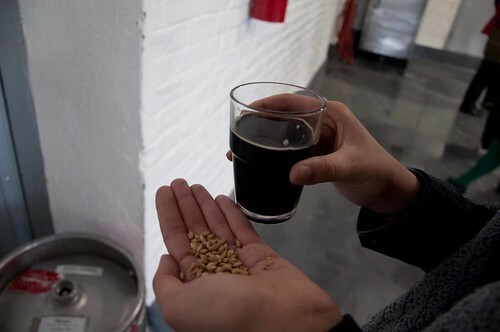 COLIN KERRIGAN TTN A visitor holds a glass of Joe Porter and a handful of barley at the PBC’s facility in Kensington. Beer was a regular part of their everyday lives. George Washington brewed his own beer. Thomas Jefferson grew the ingredients for his original beer on his farm at Monticello. The tradition of beer in Philadelphia goes back to its earliest days. In the 1800s, with an influx of German immigrants, lager beer was introduced to America and helped propel Philadelphia brewing to further success. By the 1880s, there were almost 100 commercial breweries in the Philadelphia area. “Because Philadelphia was already an established brewing center from the very beginning and because we were in a highly populated area in the Northeast, we probably were one of the larger brewing centers,” Wagner said. In 1920, Prohibition changed everything. The longstanding practice of Philadelphia brewing was shut down. While many companies continued to brew illegally, others utilized their facilities to manufacture ice, coal or other products. When Prohibition was repealed in 1933, some breweries returned, but they didn’t encounter their former successes and died off one by one. Today, Philadelphia breweries have made a comeback. This long-held Philadelphian tradition is being carried on by local breweries. Yards Brewing Company is trying to embody this history. Yards got its start when Kehoe and a friend started making beer in their dorm rooms at Western Maryland College. In 1994, they decided to turn their passion into a business and founded Yards Brewing Company. “We ran up our credit cards and gathered whatever cash we had around and found a place to do it in Manayunk and bought some equipment and started making beer,” Kehoe said. The road wasn’t easy for Yards in its early days. However, they soon outgrew their three-barrel system in Manayunk and in 1996, were able to move to Roxborough and upgrade to a 25-barrel system. Yards continued to expand. In 2001, it moved to a location in Kensington where it was able to improve its bottling line and increase its output of beer. Its current location on Delaware Avenue, where it moved in 2007, is the largest facility so far, with a 50-barrel brew house. Throughout its journey, Yards has acquired a loyal following, due in large part to its unique recipes. Yards has paid tribute to Philadelphia’s brewing history by partnering with City Tavern in 2003 to create its “Ales of the Revolution” line, based on actual recipes of the Founding Fathers. “We have Ben Franklin’s recipe for spruce beer and General Washington’s recipe for a porter,” Kehoe said. While paying homage to the city’s history, Yards is also progressively looking toward the future. Its brewery is 100 percent wind-powered. In honor of this, Yards was named the city’s 2010 Green Business of the Year by the Greater Philadelphia Chamber of Commerce. Although in recent months, Yards has felt the effect of a poor economy, its business is still strong. Yards offers free tours every Saturday for its customers. “People can come to the brewery and see that we’re actually making beer here, and also we’re able to talk to people about how we do it and our philosophy on the beer and the passion we have for brewing beer,” Kehoe said. Throughout their history, it’s this passion that has brought Yards to where it is today. Part of the turmoil of Yard’s history led to the creation of Philadelphia Brewing Company, another brewery that is now successfully embodying Philadelphia’s legacy. The PBC facility in Kensington, previously occupied by Yards, was originally built as part of the Weisbrod & Hess Oriental Brewing Company in 1885. This building illustrates the story of beer in Philadelphia. It was founded in 1880 by German immigrants and like many breweries, failed to come back after Prohibition. PBC formed in the old Yards Kensington location, continuing brewing success. Barton sees his company as a continuation of the Philadelphia tradition. The brewery has gained a loyal following because of its personal connection and original beer. Like Yards, PBC offers free tours on Saturdays. PBC takes its role in the Philadelphia community seriously. While the Bartons were with Yards, they pushed for the move to Kensington. “Every time you have something like that happen in a neighborhood that’s sort of in distress, it helps. There’s a spinoff effect,” Wagner said. Yards Brewing Company and PBC are bringing back the legacy of brewing in Philadelphia, one pint at a time. A Tyler School of Art alumna is one of CMYK’s Top 100 Creatives for her work, Hard Times Beer. In the debut of her spin-off column, Libby Peck delves into the pros and cons of being wrecked in Rome.